Deputy President David Mabuza says township and rural economies form part of calls for radical economic transformation in the country – but businesspeople warn it should not just pay lip service. 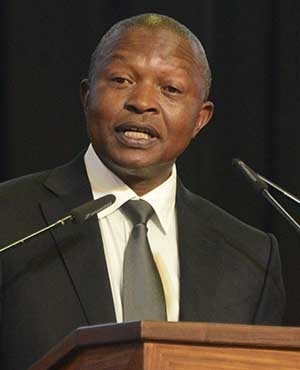 Mabuza was speaking on Thursday at the national Broad-Based Black Economic Empowerment (BBBEE) Rural and Township Economy summit at the East London International Convention Centre in the Eastern Cape. The summit, the first of its kind, is an effort to exchange ideas on how best to stimulate the economies of both rural areas and townships. “This is about the quest for inclusive economic development, redress and the reconfiguration of the economic landscape from its current status quo,” Mabuza told delegates. He said in every engagement that government has with aspiring entrepreneurs and those in the informal economy, which in the main are women and young people, the issue that is frequently raised is that of lack of business funding or sufficient support from financial institutions. “This means our people are not just lazy with no desire to uplift themselves and pull themselves by their bootstraps. What it rather means is that they need support to give life to their ideas, thereby contributing to the building of our economy and creation of jobs for the unemployed,” Mabuza said. Andile Nontso, secretary of the Eastern Cape Chamber of Business, said he hoped the two-day summit was not just another talkshop but an engagement which would result in real tangible economic benefits for the marginalised rural and township economies. “One of the problems we have picked up already is that the document that has been created here talks about township economy and little about rural economy. As a result the focus is on areas, such as Diepsloot, Soweto, KwaZakhele. They don’t talk about the 19 million people who reside in rural areas. “We have got practical issues we have given them. In the pre-summit engagement we told them what we want. They should pay people such as SMMEs within 30 days,” he said, adding that there should be consistency on the 30% local enrichment. He said to stimulate rural economies, school nutrition, for instance, must be given to SMMEs and local farmers and that local shop retailers and general dealers in rural areas should be able to sell products for the school nutrition. Nontso, who has businesses in Mount Frere, Mthatha, and East London, said schools in rural areas and townships should be supplied by SMMEs when it came to furniture, such as school desks and chairs, and for the community to keep up the maintenance. “This is what we call rural economy. We say government must stop grant cards being used in established retailers and work only in black shops and supermarkets. This way you will see those guys prospering. Even the meal cards for students in tertiary institutions should work only in black shops. In that way you will see real impact instead of discussing cosmetic issues,” said Nontso. Minister of Trade and Industry Rob Davies said the event had been preceded by consultations in all the provinces and was the brain child of the BEE advisory council. “Over time in consultation and discussions with the BEE advisory council, we started on a journey to find out how we can do more to support black economic empowerment, broad-based, that is actually a sustaining enterprise among black people in their own companies, companies led and operated by themselves,” said Davies. He said they would expect, for instance, the motor industry to be actively engaged in the development of black-owned companies in the supply chain as component manufacturers. “We are looking for all kinds of opportunities across the board to support black entrepreneurs. We have launched on top of what we do through the BEE Act, the black industrialist programme. And I am pleased to say we have supported 102 black industrialists in the past financial year,” he said. Mziwoxolo Peter, a businessperson in the petroleum sector, called for more opportunities for black people to be unlocked in the sector. Stieneke Jensma, chief director of regional industrial development at the trade and industry department, said the objectives of the intervention were to improve and enable the environment, so that rural and township developments would form part of the mainstream economy. Jensma said R500 million had been approved to support industrial parks with specific focus on rural and townships. Oscar Mabuyane, MEC for finance and economic development in the Eastern Cape, said it was time to act. Mabuza said calls for transformation should not be just for sloganeering but should talk to the real issues facing South Africans. “Thus, when we today speak of land restitution, when we speak of economic restitution, when we speak of wealth creation, we speak of radical economic transformation not for sloganeering, but as a call for policy action that will bring the severity of unemployment, poverty and inequality to its knees. “It is not racial ideology but a conscious programme of black economic empowerment, the outcome of which will lead to concrete social cohesion,” said Mabuza.